Home Commercial Insurance Brokers What is a Commercial Insurance Broker? A commercial insurance broker is an individual tasked with acting as an intermediary between insurance providers and customers. Today, the field of insurance policies can be daunting, as it’s filled with sophisticated terminology and equally complex procedures. The existence of commercial insurance brokers goes a long way in preventing customers from getting lost in the sea of trustworthy and unscrupulous insurance providers. Before a business owner rushes to hire a commercial insurance broker, there are a few things that need to be considered. Read on to learn more about commercial insurance brokers. The first thing one should keep in mind is that a commercial insurance broker is not the same as an agent. Often, business owners who are new to the insurance field use these terms interchangeably. The truth is, they are two distinct professionals, each offering different services. Other than the fact that they both sell commercial insurance policies, there’s a very little similarity between them. A commercial insurance broker goes out of his way to find his or her clients the best commercial insurance policies. It means that they are not tied to a single insurance provider. And, since their job involves comparing premiums across a variety of firms, they are more likely to find low insurance rates. Ideally, a commercial insurance broker works in the best interest of his customers. 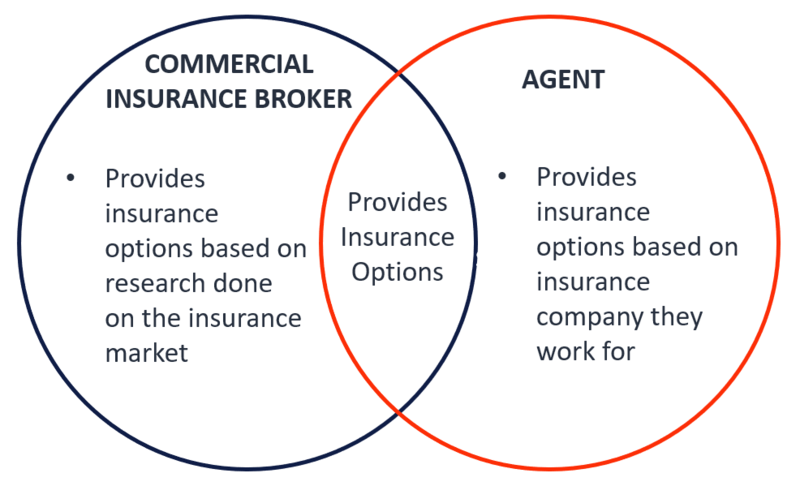 In contrast, a commercial insurance agent works for one specific insurance firm by marketing and advertising its commercial insurance products. To a great extent, the practice limits the customer’s options of comparing insurance products. So, while a commercial insurance broker represents insurance buyers, an agent represents insurance sellers. Businesses are faced with a ton of risks, ranging from strategic to financial and compliance risks. Some risks can cause devastating effects on business operations, which is why getting a commercial insurance policy that protects the firm and its assets is crucial. A commercial insurance broker helps business owners assess the risks their firms are facing. In doing so, the insurance broker is able to recommend the best insurance policy that addresses the identified risks. Depending on the situation at hand, a commercial insurance broker may also direct you to a lawyer or accountant if there’s need for further consultation. Professional commercial insurance brokers are also known for their strong work ethic. It means that they work tirelessly to ensure their clients get what they want. After identifying the ideal insurance policy, such a broker guides you through the application process. Company owners applying for such policies for the first time will find such guidance and support incredibly valuable. Any individual can sell insurance coverage, but only a great broker will work with clients throughout, even as the needs of their firms change. The relationship between a commercial insurance broker and his client must be one of mutual respect and constant communication. Be wary of brokers who are more inclined to selling insurance products that don’t meet the client’s needs. Ideally, a good broker is one who first listens to his customer, taking note of the specific needs that need to be addressed. Once he obtains a good understanding of the customer’s business needs, he researches different insurance products that fit the scenario. He then offers his client the different options and advises him on which one is the best. When explaining the different insurance policies that could benefit his clients, a good broker explains both the strengths and weaknesses of each insurance policy. Most clients don’t like changing policies or brokers frequently. To prevent such a scenario, a commercial insurance broker should provide outstanding customer service. It entails doing proper research beforehand so that he is prepared with all the answers to the questions that his client might ask. Another aspect of providing quality services involves communicating any good or bad news regarding the insurance policy without delay. Clients are likely to establish long-lasting relationships with trustworthy brokers who prove that they can efficiently handle their accounts. The best commercial insurance brokers are ones who can be reached at any time of the day or night. Even when they’re busy, such brokers make time to get back to their clients and provide the necessary feedback. The specific form of communication that the broker utilizes does not matter. What matters is providing prompt feedback to his customers. Why Hire a Commercial Insurance Broker? Without a doubt, the primary advantage of enlisting the services of a commercial insurance broker is the impartial and unbiased information and advice provided by this expert. Since these brokers have connections with a ton of different insurance providers, they are in a better position to identify policies that could work in favor of their clients. Unlike a commercial insurance agent, a broker is not indebted to one specific insurance firm. A broker is able to make commission regardless of the insurance firm he directs his customers to. In fact, most brokers take time to analyze different insurance policies before recommending the best to their customers. An insurance agent, on the other hand, will be inclined to direct his customers to the particular firm that he’s affiliated with. It means that a commercial insurance agent does not always offer the best insurance rates on the market. A number of business owners are not aware of the many risks that their companies are exposed to. Often, this is not because of a lack of due diligence but because they have not been provided with the right guidance. A professionally qualified commercial insurance broker will perform a detailed analysis of enterprise with the aim of identifying any risks that could harm your business. Such an expert will not shy away from informing his client that having too many creditors could run his firm bankrupt. Other risks that a business is likely to face have to do with compliance issues, operational activities, and even reputational risks. After identifying these risks, a commercial insurance broker then goes out of his way to find feasible solutions for mitigating these risks. Business owners need to ensure that they obtain the right commercial insurance policies that cover their enterprises. Unfortunately, they often face many responsibilities that hinder them from researching insurance policies. Some of these company owners who do attempt to look for a good insurance policy on their own end up becoming victims of illegitimate insurance firms. The best way to go about this is to hire a commercial insurance broker. This is an expert acting as an intermediary between reputable insurance companies and the client. These brokers put the needs of their clients first before those of the insurance provider. This way, they are able to find commercial insurance policies that offer sufficient coverage with very affordable premiums.